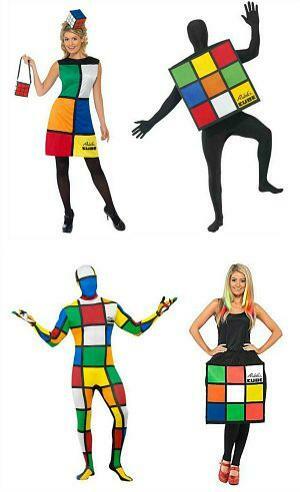 On this page you can view four different Rubik's Cube fancy dress costumes for men and women. Scroll to the bottom of the page to see the live ebay feed which features top fancy dress suppliers selling brand new, "buy it now" outfits at low prices. Simplyeighties.com is a participant in the Amazon EU Associates Programme and ebay affiliate advertising programmes which are designed to provide a means for sites to earn advertising fees by advertising and linking to Amazon.co.uk and ebay.co.uk. 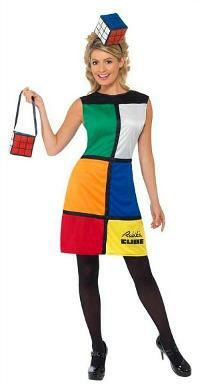 The popular Rubik's Cube Dress Costume by Smiffy's is a real head-turner and is perfect for 80s dress-up. The three piece outfit consists of a cube-themed dress with a matching headband and handbag. Comes in three sizes. Available in small, medium and large sizes, you'll look truly puzzling in this 3D cube costume dress. Please be aware that it will be impossible to sit down in this costume without slipping it off. Therefore, you may prefer to opt for the dress outfit featured on this page instead. 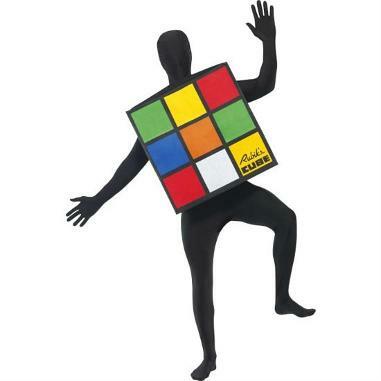 This 3D Rubik's Cube Unisex Costume will guarantee that you stand out from the crowd, and it's ideal for 80s parties and events. Add a black second skin costume to complete the look. 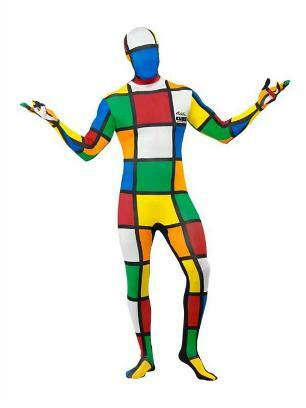 An officially licensed, all-in-one Rubik's Cube suit which is available in medium and large sizes. Features an under chin opening and concealed fly.